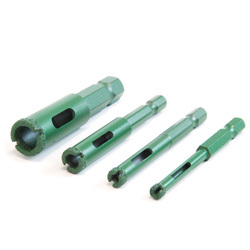 Vacuum brazed bond for fast, clean, chip-free drilling. Remove material plugs quickly, easily. For tile, stone, and glass applications. Use wet for best results. 1/4" quick change hex shank. For Tile, Ceramic Tile, Porcelain, Marble, Granite, Glass.